Can you confirm these amateur observations of Chilabothrus strigilatus? ailurus: Bahama Is. : Alligator Cay and Cat Island; Type locality: Alligator Cay, Bennett's Harbour, Cat Island, Bahama Islands. fosteri: Bahamas: Bimini Island; Type locality: North Bimini Island, Bahama Islands. fowleri: Bahama Is. : Andros Island, Berry Island; Type locality: Fresh Creek, Andros Island, Bahama Islands. mccraniei: Bahama Is. ; Type locality: Ragged Island, Margaret Cay. strigilatus: Bahama Is. : New Providence I. including Rose I., Eleuthera I., Long I., Exuma Cays, Andros (fide GARMN 1887); Type locality: New Providence Island, Bahama Islands. Comment For illustrations see Cochran, 1941; Mehrtens, 1987; Tolson, 1987. Synonymy: Mostly after SCHWARTZ & HENDERSON 1988. This species has been considered as a synonym of Epicrates striatus (e.g. by WALLACH et al. 2014: 274). Sheplan, B.R., and Schwartz, A. 1974. 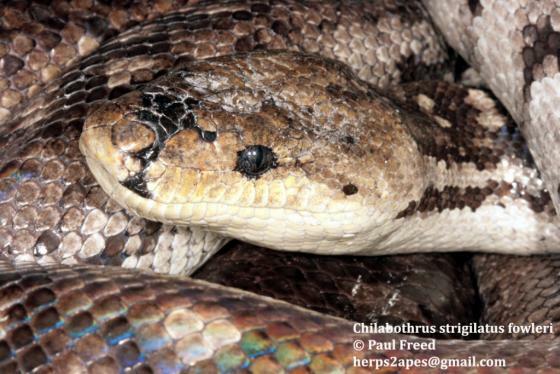 Hispaniolan boas of the genus Epicrates (Serpentes, Boidae) and their Antillean relationships. Annals of the Carnegie Museum 45:57-143. Tolson, P.J. 1987. Phylogenetics of the boid snake genus Epicrates and Caribbean vicariance theory. Occ. Pap. Mus. Zool. Univ. Michigan (715): 1-68.